Looking at the history of New Orleans there are many famous people that are still remembered today. It is believed that New Orleans is a place popular for its deliciously famous beignets, gumbo, jazz music and voodoo. Voodoo practices originated in the West Indies country of Haiti during the French colonial period. The slave-owners in the south tried converting all of the slaves into being a Christians but the slaves just wouldn’t let that happen. Typically in the world the term voodoo is affiliated with being evil, but for Marie Laveau many people saw her as doing something good. She not only helped people with their health and hair, but when she began practicing she specialized in romance and finance. Although Marie Laveau has been long gone people still visit her gravesite in hopes that she’ll grant their wishes. 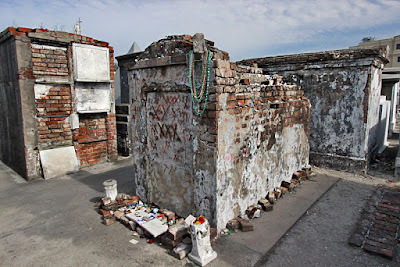 Marie’s remains are located at St. Louis Cemetery #1. In the picture above is where Marie Laveau’s remains reside. Many believe if they go to her grave site and draw an x on it and leave her something as a sacrifice she’ll grant their wishes. In a YouTube video, Brett Stanker gives a tour of the different tombstones at St Louis Cemetery #1 and he comes upon Marie’s. While in another YouTube video Charles Chamberlain sets the stories straight about the rumors on Marie Laveau. Not everyone was aware that Marie Laveau wasn’t only one person, but it was also her daughter Marie Laveau II. 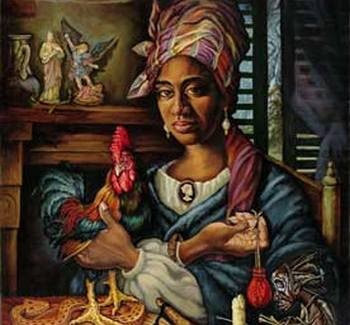 Marie Laveau had 15 children, but she named one of her daughters after her. Like her mother, Marie II also practiced voodoo. St. Louis Cemetery #1 has become a well-known cemetery not only because of Marie Laveau but for others that are laid to rest here. Black, Annetta.”Saint Louis Cemetery No.1”. Atlas Obscura. N.p., n.d. Web. 7 Oct. 2015. Chambers, Wendy Mae. "Voodoo on the Bayou - Marie Laveau." Voodoo on the Bayou - Marie Laveau. N.p., n.d. Web. 15 Oct. 2015. Stanker, Brett. “A Walk Through the Oldest Cemetery in New Orleans.” YouTube. Youtube, 21 Dec. 2008. Web. 13 Oct. 2015. St. Louis Cemetery No.1| Save Our Cemeteries.” Save our cemeteries. N.p., 10 Sept. 2015. Web. 07 Oct. 2015.